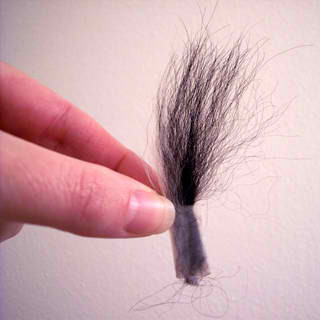 Hair on your pants from a loved animal could be very frustrating. It could also make you so annoyed with your pet that you would avoid them at all costs when you’re about to leave for a special occasion. It finds its way deep into carpets, furniture, and car upholstery as well. This article provides information on how to remove pet hair from clothing, carpeting and/or upholstery. Weigh it down. Lightly dampen the palm of your hand. Wipe the pet hair off in a downward motion. The hair will ball up and stick to your damp hand. This works because the hair becomes wet, therefore heavier. This results in it being unable to fly back to your pants (or whatever surface you’re dealing with) in response to static electricity. Barely dampen a clean, regular kitchen sponge. (Use a sponge mop if you’re removing pet hair from a low-pile carpet, in which case the floor should be thoroughly vacuumed first.) Rub the fabric, upholstery, or carpet with the sponge. The fur should roll up into clumps that you can pick off by hand. Inflate a balloon and rub it across the surface that has pet hair on it. The static on the balloon’s surface will attract the hair (works on yours, too) which you can collect and then re-use the balloon to get more hair. GREAT FOR THE KIDS TO DO! Rub hook-and-loop (e.g. Velcro) curlers on the surface to catch the hair. If the curler has a metal inner form, it can be bent to reach corners. Apply fabric softener. A fabric softener sheet that normally goes in the dryer can be used to pick up pet hair. You can also mist the surface with a mixture of fabric softener and water to “prep” the area before removing the pet hair using any of the other methods. Place your clothing in an area isolated from your pets. Groom your pets regularly to reduce the amount of loose hair on them. Rolling, sticky lint removers work, as does a piece of duct tape wrapped around your hand with the sticky side out, but after one swipe you must move onto the next piece, which is more wasteful than the above methods. Use masking tape. It’s relatively cheap and you can tear off a piece, tape the ends together, and then rotate the tape while removing pet hair from clothing, etc. Clothing can be put in a washing machine and into the dryer with a static sheet. Once it’s cleaned, hang it up. Be careful, though, because dark solid colors tend to spot (almost looks like grease spots) when they’re the only clothes in the dryer with a dryer sheet. In the office, the sticky sided clear label holders shipping companies provide make an excellent hair removal glove.